An open letter to my fellow direct response copywriters about finding clients. If you’re a direct response copywriter, pay close attention to this blog because I’m about to reveal something extremely personal. The quality of your clients determines pretty much everything in your life. Money … time … mental health … professional satisfaction … and everything else. If you’re a direct response copywriter, then you know exactly what I’m talking about. Think about it. Bad and mediocre clients create all sorts of problems. Great clients with big budgets make life a ton easier. OK – it’s not quite that black and white but you KNOW what I’m talking about … and you know it’s true. Right now, I rank #1 or #2 for many key search terms like “direct response copywriter.” And this brings me tons of leads: over 500 in the past 4 years. And you might think I’d be happy with this. But I’m not. And here’s why. It’s something I thought about the other day. Every competent direct response copywriter should be grossing at least $200,000 a year in fees – before royalties. And that’s based on working just 30 hours a week … no more than 45 weeks a year. That’s $148 per hour if you’re counting and that's achievable. Based on the clients I have through my website, I wasn’t coming anywhere near that. So I made a big decision. I looked at all the different ways to find clients. I found the hardest but most powerful way to find the ultimate clients. Bob Bly used this method and I’m sure you know all about Bob’s success. David Ogilvy used this method to get his advertising agency started … and he built a whopping advertising agency. The method? Build a database of the clients you want and pound away at them. Building that database is extremely hard and time-consuming. That’s the bad news. The good news? In building my database, I created a list of OVER 2,000 potential clients. These are people who are looking for copywriters … or they will lead you to people who are looking for copywriters. Even better news … I’m making this database available to other copywriters on a first-come first-served basis. First – and I’m not ashamed to admit this – I hope to make some money here. I’m a self-employed entrepreneur with financial goals. Second – there’s so much work out there that I’m happy to share the list. How many times have you heard this from a decision maker ... "we're always looking for copywriters." OK – enough of this ethereal blog stuff … let’s get down to business. 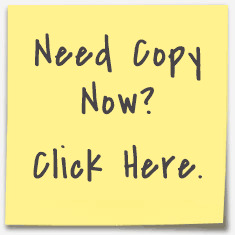 As I official launch my database, I’m making it available to serious copywriters like you for $99 a month for 9 months. It's normally $1,295 as a one-time payment. And because I’m a direct response copywriter, I’m going to use the “coffee justification technique.” Maybe you've heard of this! Every day, I spend $2.65 on a large coffee. That’s almost $80 a month. You get the picture – depending on how much you spend on coffee. To go to the official sales page, click here. And one more thing … you won’t find this database anywhere else. The “usual suspects” like AWAI and Dan Kennedy and Bob Bly don’t have this. And I have bought items from AWAI and Dan Kennedy and Bob Bly and have huge respect for them all. But you certainly won’t find it with anyone else ... none of the people who are in the "client getting" business have anything like this. But seriously – if you want to get my list … click here now. And if you have any questions, please use the contact link below. Direct Response Copywriter on How Not to Find Clients. Part 6. How NOT to Find Clients. Part 6. NOTE: You're reading a series of essays about how to find clients ... and how NOT to find them. This series will be extremely controversial. Read the blogs and you’ll discover my experiences with finding direct response copywriting clients … what works and what’s a waste of time. The goal is to help you find “elite” level clients with deep pockets who are looking for top-quality creative talent. There are sites out there like Elance that match people who need copwyriting with direct response copywriters. Elance is the 900 pound gorilla in the space and I have to imagine it’s highly profitable. There are other big-time sites that essentially do the same thing. As a result, imitators have appeared. They want you to list yourself … for a fee … with the promise that potential clients will definitely find you. Some sites are somewhat rudimentary while others are quite technically complex … and well designed. It’s possible you might find a client or two but it’s unlikely. The reason? These sites rarely have any traffic because the site owner doesn’t want to buy traffic. Typically. I’ve listed myself on some of these sites. I’ve even paid a fee. I hate to say it but many sites are simply trying to scam a monthly fee out of you before you realize it’s all a waste of time. With these sites, you’re basically HOPING to find the right clients. Marketing is NOT about hoping. Marketing is about being aggressive and taking what you want. If you're serious about becoming a serious direct response copywriter then you have to go out and find the clients you want. To find these clients, you need a database ... and you can find it here. How NOT to Find Clients. Part 3. NOTE: You're reading a series of blogs about how to find clients ... and how NOT to find them. This series will be extremely controversial. Read the blogs and you’ll discover my experiences with finding clients … what works and what’s a waste of time. The goal is to help you find “elite” level clients with deep pockets who are looking for top-quality creative talent. This may be confusing but hang with me for a minute. With inbound marketing, you optimize your website for the search engines and you get leads. This works for me and it's been my #1 source of business for the last 3-4 years. Right now, my website ranks #1 for several search engine terms like "direct response copywriter." Trust me, I'm not complaining. Several great clients have come my way. But I also get a number of poor leads. "Boo hoo," you say ... and with good reason. I'm sure, if you're a direct response copywriter, you'd like to have this ranking. Here's the downside. At some stage, someone is going to take my spot and I'll be on page 2 where nobody will see me. This could happen tomorrow due to some Google algorithm change. Or it could happen in a few days or weeks. I can't rely on this #1 ranking forever. I'm not in charge of this situation. And I fully admit I know little or next to nothing about SEO. So I need to gain complete control of my marketing. That's why I created a database of 2,000 potential clients. Armed with this database of direct response copywriting clients, I don't have to rely on being found. I go after the clients I want. That's what direct marketing is all about: going after the clients and customers you want. Inbound marketing is NOT a pure form of direct response marketing. To find the "elite" clients, you have to be more aggressive. If you want access to my database of potential clients, click here. I’m not a big social media person. Occasionally, I see a Facebook or LinkedIn group with hundreds, even thousands, of copywriters. A quick Google search reveals there are 45,000 advertising agencies in the United States alone. If each one has one copywriter, on average, that’s 45,000 copywriters. While there are tens of thousands of copywriters, there’s a lot of work out there … especially with the explosion in digital advertising. There's a huge need for regular copy and content. However, if you’re a solo copywriter … which we all are ultimately … it’s a mistake to focus on numbers of copywriters and how many agencies there may be. The focus must be on finding the RIGHT clients. I can help you find those deep-pocketed clients who will treat you with respect. I’m pleased to announce the official launch of COPYWRITER CLIENT DATABASE. It’s a handcrafted database of over 2,000 carefully-selected potential clients. With access to this database, you can find your perfect clients. Click here to discover more about COPYWRITER CLIENT DATABASE. It’s a must for every copywriter. In fact, a fellow copywriter found the sales page before it was officially live and acquired access to the database right away. Before the official launch, five copywriters purchased access. What’s the biggest benefit? It will help you develop your own personal database of direct response copywriting clients ... without spending the approximately 700 hours I spent working on the initial database. Again … here’s the page. In studying how great marketers get clients, I discovered one common thread: they all built a databse of ideal clients then started to pound away at the database. But you have to have the database first.